I see many clients every week that are survivors of conditions such as traumatic brain injury, spinal cord injury, and stroke. They are assisted by their wheelchairs, walkers, canes, and care givers. I know these things are designed to help the person with activities of daily living, however, I’m starting to think these people are becoming too dependent on these things and it’s actually hurting their progress. For example, I work with Bob twice per week for an injured hip and knee. He was in a brace and using a walker ever since he started with me. We were hitting a roadblock in his training because there was only so far we could go with him in the brace and walker. He asked the doctor about keeping the brace on or taking it off, and the doctor said to try things without the brace. So we did and Bob hasn’t looked back. 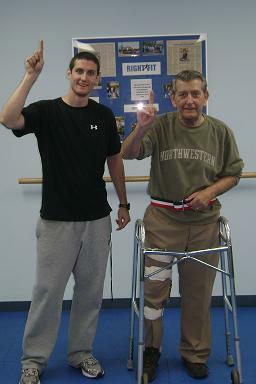 He has greatly increased the strength in his leg along with his balance and his confidence in his walking. He can now walk over 20 yards unassisted. That would not have been possible with his brace on. I feel sometimes people let the idea of being disabled consume them and they just accept it as a way of life. It is our job as professionals in the industry to take them out of their comfort zones and put them in situations where their brains and bodies have to adapt to new stimuli. I’ve taken this approach with all of my clients who are considered to be “disabled” and the results have never been better. They are so used to their bodies not working properly or not working like they used to so they start to buy into the idea that they’ll never improve. I tell them, “Just because it doesn’t function properly doesn’t mean it can’t function properly.” Once they start to try new things, they realize they aren’t as disabled as they thought they were and their improvement goes off the charts.